If you don't remember the 2010 alien invasion film Skyline, or you never saw the wretched movie, consider yourself lucky. But since the film pulled in over $66 million worldwide on a budget of just $10 million, that means a sequel is coming. The end of the first film hinted at a pretty damn wild and crazy continuation since one of the leads was sucked into the mother ship of the invading alien race and turned into a half-human, half-alien hybrid. Now the teaser poster revealed on the developing sequel's Facebook page seems to hint at the story continuing from that point, which actually doesn't sound wholly uninteresting. More info below! The film is being sold at Cannes Film Market, so there's no guarantee we'll ever hear of the project again, but the image piques our interest, even though a sequel still seems completely unnecessary and unwanted. The original film from directing duo Greg and Colin Strouse (who have more talent in visual effects than storytelling) was empty of any substance and merely looked nice, but maybe a sequel can tell a better story? However, this time it will be Liam O'Donnell, writer and producer of the first film, behind the camera, so we're not all that hopeful this will be better than the first film. 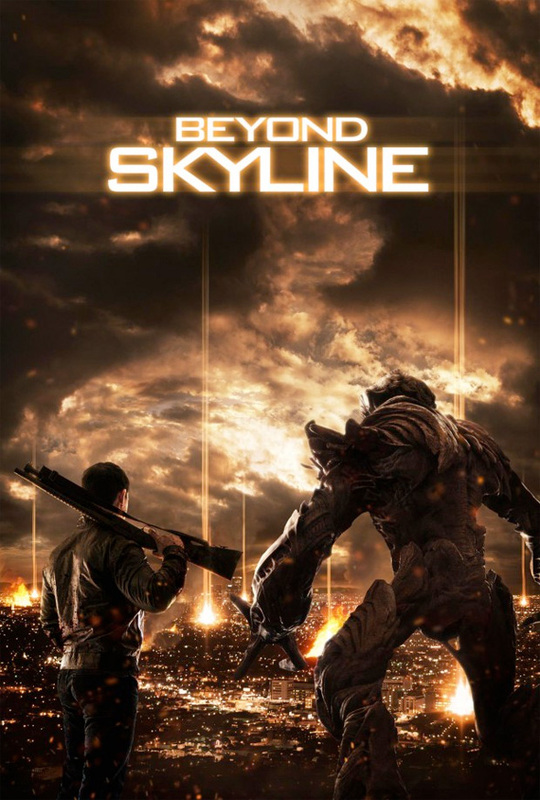 Anyone care about Beyond Skyline? I'm not saying this warranted a sequel or that it was any good but I saw it after hearing all the terrible things said about it and I don't think it was THAT BAD. This was an okay B-movie, pretty remarkable to be pulled off for $10 million...there are horror films that cost more than that. I do agree that the Bros are better at visual effects than storytelling, though. The thing I thought made the first movie bad was the terrible acting and casting. Also, they killed off the dude from scrubs, which was a bummer, because it left us with the two failed Abercrombie models who can't act... The best part of the movie was the closing credits scene where the dude is a giant alien thing and goes apesh*t on all the other aliens. This might be ok, first one was not a total waste, had some good ideas. It was just mucked up by bad acting and writing. Excellent point. So glad people are finally comparing art house films and sci-fi action. Can we talk about how much better Europa Report is vs. Mulholland Drive? Jesus! Way better than The Thin Red Line. This comment is sarcasm at its best. Well done. That's right, fawn over the comments that agree with you. How vapid. First one wasn't that bad really. I'll check this out. Luckily my policy of turning off any movie that plays a 30 Seconds to Mars song saved me from enduring more than 10 or 20 minutes of the first. I'm sure part 2 couldn't be any worse. How often does that come into play? Not incredibly often, but every time it does come into play, it's in the middle of a pretty terrible movie. I forgive their terrible music only because Jared Leto is such a fantastic actor. The first movie was so bad, after we walked out we bought tickets to go into another movie just to get it out of our head. Ain't no way I'm going near the sequel. I actually enjoyed the first one. Never had interest, then one day it was on Netflix, and I was in the mood for some alien invasion. Had no expectations, and I was able to have a good time watching it. The way it ended, I'm glad they're going to follow up. Still not expecting much. I've seen worse. It was a good old 'better than watching nothing' movie. I quite enjoyed it to be honest. Skyline is a guilty pleasure for me..................................but I in no way want a sequel.